I liked sweet potatoes, of all ways. Baked, boiled, steamed, soup, and even fried. And all colors of it as well. So, I had to have varieties in my sweet potato soup. I preferred it with less sugar, too. Honey rock sugar would make my preffered choice, and it is good for smoothen dry throat, reduce “heatiness” and improve skin and complexion. 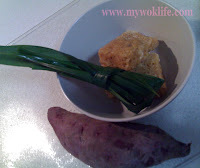 To add better flavour to my sweet soup, I liked to use also the pandan leaf. It gives an aroma of pandan in my palate when having it. To the non-initiated, the yellow and orange sweet potatoes are more suitable to cook in soup as the purple flesh type is softened easier than other types. Thus, my experience tells me not to over boil them. 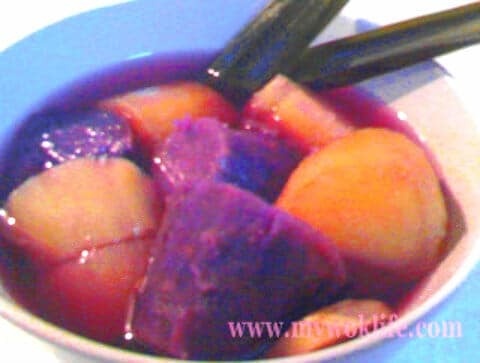 Note that the colour of the soup will turn to purplish due to the purple flesh sweet potato. The longer it is cooked, the darker purplish soup it would be. Hence, do not be alarmed. It gives an uniquely nice colour to this dessert without affecting its taste, indeed. 1) Bring a pot of water to boil. Put in yellow flesh sweet potatoes, and bring to boil again. 2) Reduce heat to simmer, for 10 min. Add in purple flesh potatoes, ginger, pandan leave and rock sugar. 3) Simmer for another 15 min, or until sweet potatoes soften. Serve hot. Many people has this perception that sweet potato is high-carbohydrate food. In fact, the carbs value content of sweet potato is much lesser than in white rice by almost half the carbs value. Sweet potato is low in GI, and relatively low in calories. It is also high in nutrients especially Vitamin A which is good for eyes for children. Sweet potato is a better alternative to rice. I like to cook the sweet potatoes with plain porridge for lunch or dinner, and add low-fat milk to the steamed sweet potatoes to eat as breakfast. It’s simply wonderful! A regular bowl of sweet potato soup here counts about 170kcal. Tips: Add more sugar to yield “standard” sweetness in it. *Remove the pandan leaf and/ or ginger slice earlier, if mild flavour preferred. * Sweet potatoes will disintegrate easily, if over boiled. * Add yellow flesh first, and then purple flesh as the purples one softens faster than the yellow or orange ones. *Choose different colour flesh, as desired. Thanks for visiting. Hope you try my recipes and like it! And, thanks for sharing it with your friends, really appreciate your kindness!! Visit me more, load me with questions, if any!